Halloween is upon us. The pumpkins crept into the local craft store aisle late July, which while nauseating, seems standard. Porches are adorned with mums, hay, and cornstalks while grocery aisles are flanked by bulk candy displays. Tis the season for holiday commercialism. My oldest is two so the concept of trick or treating remains mostly foreign to her. Her current obsession is anything and everything Frozen and she's just entered a dress-up phase. A month ago she decided she'd like an Elsa costume and I happily obliged. A longtime Disney fan, I had eagerly awaited the days of dress up. I have planned for the holidays since the ultrasound technician first uttered the words "it's a girl." I did what a lot of parents do, I daydreamed about possibilities and opportunities to capture innocence and fun through my child. My expectations were shaped through my own experiences and perceptions. Alas, this is where I fell victim to the scary parent trap. For the last month, her theme song has been “Let it Go. ” Frozen fever has infiltrated our home. I expected this to happen. I didn’t expect my daughter to assign us family costumes, which is exactly what she did. One evening we sat around the dinner table and she cast us in our roles. According to her, my husband is Kristoff. Sigh and swoon. I love the way she sees her daddy. Of course, he gets to be an iceman; strong, brave, and desperate to protect his love, Anna. While you most likely won’t seem him roaming the streets of Madison in costume, he’ll happily pose for a photo in the privacy of our home. Her baby sister is Olaf. I squealed in delight. How adorable! I pictured chubby baby thighs emerging from a stuffed costume and felt my heart expand in a million directions. Now, it’s my turn. Secretly, I’ve been waiting for an excuse to dress up in an adult princess costume for awhile, so I held my breath expecting to be cast as Kristoff’s love interest. “Mommy’s going to be Sven.” Are you kidding me? 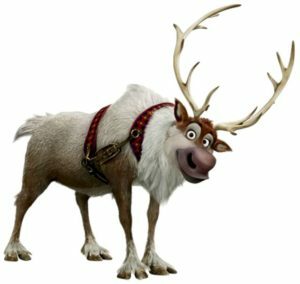 Sven is Kristoff’s reindeer. “Can mommy be Anna?” I ask. “No, mommy’s Sven,” she replies. Her determination is palpable. I see the look in her eyes. I’m Sven. There’s no denying this request. I wounded for a brief second. A reindeer costume isn’t the most flattering. I wanted her to see me as a princess. Instead, I have hooves. Almost immediately I hated myself. Was I really about to challenge a two-year-old on a Halloween costume? This was her choice. Why did I expect to be a princess? Probably because it's what I remember from my own childhood. Why did I feel disappointed that our photo op wouldn’t be quite as cute with my antlers in tow? Most likely it's because of my vision for the perfect snapshot. Our expectations can be scary. We tell our kids they can be anything, to dream big, create, and play, so why do we allow ourselves to infringe upon these same beliefs and ideas? My daughter wants me to be Sven. Why couldn't I see the joy in being a reindeer? I forgot about the fun and possibility in other roles as well. See, there’s more to Sven than sidekick. He’s silly and loyal. Often, he acts as Kristoff’s conscience. Blinded by my own expectations, I failed to see the other image, which can be dangerous in fairytales and parenthood. There’s always something more beyond our expectations. This is an invaluable lesson to remember, especially as we gear up for more holidays. Thanks for the lesson, Elsa. I’m letting go of what I expected and embracing what I've been given. My antlers are on.